Throughout the show’s 1000 episodes, America’s Most Wanted has caught thousands of criminals thanks to the pioneering efforts of John Walsh. However, this might be the first time that the show has caught a criminal thanks to an appearance on another television show. John Walsh was a recent guest on Live With Regis and Kelly to promote AMW and its big special edition, and when previewing the show, Walsh discussed the case of accused wife and mother-in-law murderer James Albert Turner Jr. That brief appearance and discussion led to a tip, which caused U.S. Marshals to apprehend Turner in Concord, North Carolina, a few short months after the December 27, 2009, killings. That’s really an impressive testament to the power of television, isn’t it? AMW has been on the air for 22 seasons, and is now such a powerful tool in the arsenal of law enforcement that it doesn’t even have to do a proper show on a guy to get him arrested, merely mention him in passing while being discussed on another show! 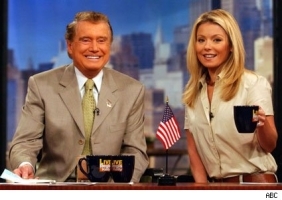 As for Regis Philbin and Kelly Ripa, they can say their show caught a criminal.